Casual Authentic Italian Dishes that Aims to Please! Holiday cheers are the perfect time to indulge and here is another place to go authentic Italian this Christmas holiday! Head on over to DV Ristorante Pizzeria at Bukit Damansara for a taste of their Christmas Eve Dinner Menu this holiday season that comes with a complimentary glass of Prosecco. The casual Italian dining, owned by Frankie Ferrarese, is famed for their hearty and rustic Italian dishes and wood oven pizzas. It’s the kind of friendly neighborhood restaurant that one can feel at ease dining and enjoy comfort Italian dishes. The ambience is simple and exude warmest the moment one steps in. Guests can catch some actions from the bar or the open pizza kitchen equipped with wood oven which gives guests a warm and fuzzy feeling with lots of earthy aromas from its baked goods. First up, DV Ristorante Christmas Eve Dinner Menu takes diners into an Italian Christmas experience with a 4-Course menu. The Christmas Eve Dinner Menu comes with a glass of complimentary of Ruffino Prosecco which is the perfect kick off to the yuletide season. If you prefer a non-alchohol drink, a mocktail will be replaced upon request. The Italians loved their bread and so there will always be a basket of freshly baked bread served with olive oil and balsamic vinegar to whet the appetite. For starter, the Italians loved their cured meat and so Bresaola Wrapped Scallops reminded us of all the gorgeous cured delicatessen meats. Scallops is wrapped in air fried Bresaola, aged salted beef air dried and cured, served on a bed of fresh arugula, Sicilian Blood Orange and shaved Pecorino cheese. The scallops are juicy and plump while the Bresaola has an intense meaty salty note. This gorgeous started managed to evoke all the beautiful flavours of salty, sweet, sour and bitter on a plate. Our entrée was Tortelloni in Double Boiled Consommé. How would an Italian meal be without pasta? The pure delicate flavours of the consommé are warm and soothing, so much so I literally scrape the bowl for the last drop, ignoring my manners at the table. The authentic homemade tortelloni has a light stuffing made of chicken and beef ham. What won my heart was the golden crispy garlic toast served on the side. That was so good, I wanted more garlic toast. It is a dish that many homes in Italy would be proud to serve! There are three choices of main courses available featuring beef, veal and fish. We tried two out of the three and were pleased with the choices available. Bollito Misto is served the way the Italians like with a minimalist presentation. The dish is a traditional Northern Italian style boiled meat and is served with marinated vegetables on the side. Our plate had sausages, beef cheek, ox tongue and chicken. The broth has been simmering for hours, gathering up all the essence of the meats. Again here, it’s a very earthy and hearty dish, a dish where most Italians adored for its simplicity and home cooked flavours. As this is a meaty dish, the piquant and tangy marinated vegetables cut through the richness of the meat and balance the flavours cleverly. The second choice of Veal Involtini is just as delicious as it looks! It’s a roulade of veal wrapped with organic spinach, anchovies and shallots. The veal sat on a bed of creamy spiced pumpkin puree and is served with a caramelized apple half and a luscious pieces of seared foie gras. Sautéed haricot verts, carrots and shallots completed the dish. The veal is tender and went very well with the moist spinach stuffing. I like how the spiced pumpkin puree acted like a thick flavour sauce to the roulade. The highly prized foie gras is cooked to perfection while the apple added a delicate sweet fruity note to the overall dish. For certain regions of Italy, fish is a must for Christmas. Some regions even go all out on a seven course fish menu for the holiday season. The third choice is Monk Fish Fillet, featuring pan seared monk fish fillet served on lentils and asparagus tips together with quail egg. All dinners have to end and ending it the traditional Italian way is a house baked Panettone which owner Frankie personally is proud off as the recipe is tweaked to perfection. The Milanese Christmas cake or rather bread is served warm on a pool of vanilla sauce and shavings of chocolate. Too simple for some maybe but we were assured that Panettone is simply a must for Christmas. I happened to enjoy the fluffy and sweet notes of the Panettone made luscious by the creamy vanilla sauce. 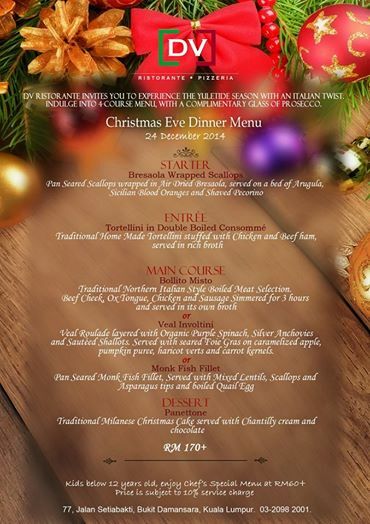 DV Ristorante Christmas Eve Dinner Menu is priced a RM170+ per adult and comes with a complimentary glass of Prosecco. Kids below 12 years old can also enjoy Chef’s Special Menu at RM60+ per child. Besides the Christmas menu, DV Ristorante has many Italian favorites that aim to please. Go for their signatures pizza and pasta and there are several authentic Italian main dishes as well. It’s without any doubt that wood oven creates the perfect pizzas in the world. The aroma and heat will give the pizzas the essential flavour, texture and aroma a darn good pizza has. Our selections of the evening were Margherita (RM22), Bresaola e Rucola (RM30) and Quattro Formaggi (RM28). As one can see, the pizzas here are as rustic as it gets. Hand crafted and formed with a few tossing, the pizza base is medium thick with a good solid light crust and lightly chewy insides. The sauces and cheeses made the pizza as good as it is. I personally enjoy the Quattro Formaggi which features intense cheeses like gorgonzola, asiago, parmiggiano reggiano and mozzarella. I love my cheeses, can’t you tell? We also savored Spaghetti Allo Scoglio (RM28) featuring pasta and seafood in tomato sauce. Lots of approving marks here for the al dente pasta, well-seasoned tomato sauce and beautifully cooked seafood. When classics are executed well, the satisfaction will always be there. Our table of foodies agreed unanimously that the Chicken Scloppine with Wild Mushrooms (RM28) is superb! Moist and tender organic chicken scallopini is seared just right and is smothered in a savory and earthy luscious cream sauce flavoured with porcini and other mushrooms. The gentle squeeze of lemon really lifted the flavours of the dish even higher. We polished this dish happily. Go ahead and check out DV Ristorante Pizzeria. Even if it’s not for the festive menu, I am sure many will be pleased with their rustic Italian offerings of appetizers, pizza, pasta, main course and desserts. This casual Italian neighborhood eatery is decently priced and offers a no-thrill but honest-to-goodness Italian cuisine in the city.